Posted on 2013-07-28, by bitsh01. Stunned by statistics? Exhausted by Excel? Relax! 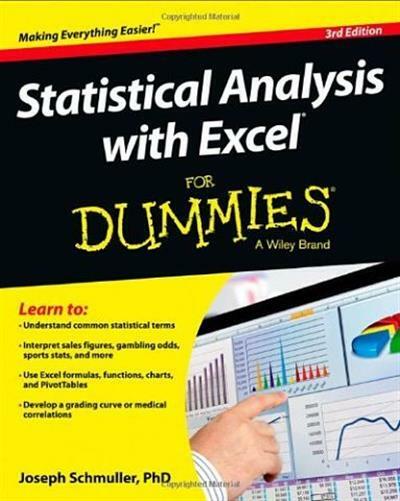 This book makes it easy to learn statistical analysis and actually use it to interpret the statistics of everyday life. Take your Excel knowledge to a new level as you discover how to use Excel's perfectly designed tools to analyze and understand data, predict trends, make decisions, and much more. Joseph Schmuller, PhD, is a technical architect at Blue Cross-Blue Shield of Florida. An adjunct professor at the University of North Florida, he is a former member of the American Statistical Association and has taught statistics at the undergrad, honors undergrad, and graduate levels.